Now that you are in Namibia, why not include some of the spectacular highlights of neighboring Botswana and Zimbabwe? 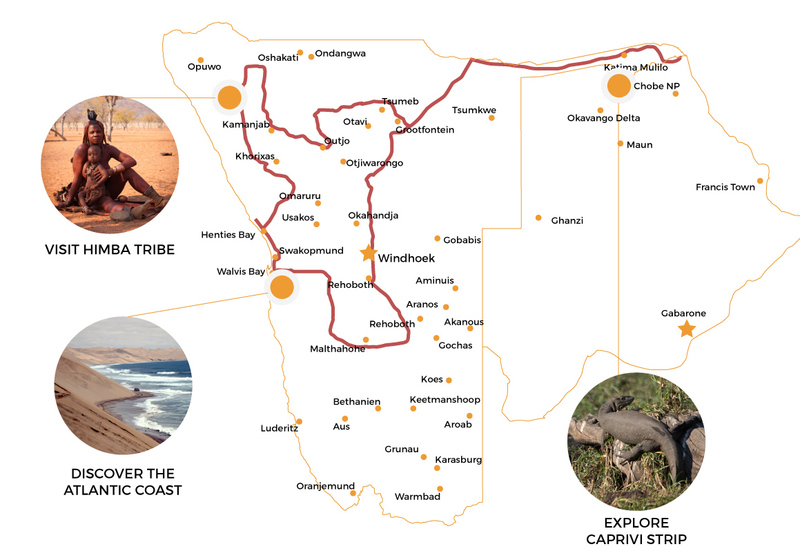 Your journey starts in the rusty red landscapes of the Kalahari Desert and Sossusvlei, where you can climb one of world’s highest dunes. The Atlantic Coast has much to offer, from kayaking on the ocean to sand boarding in the dunes. In the ancient landscapes of Damaraland and Kaokoland you will find intriguing cultural heritage of San-rock art and traditional Himba villages. Of course, a safari in Etosha National Park with its large numbers of wildlife cannot be missed. A paradisiac, lush green world opens up when you drive into the Zambezi Region, leading you to Botswana’s breathtaking Chobe National Park and the spectacular Victoria Falls of Zimbabwe. 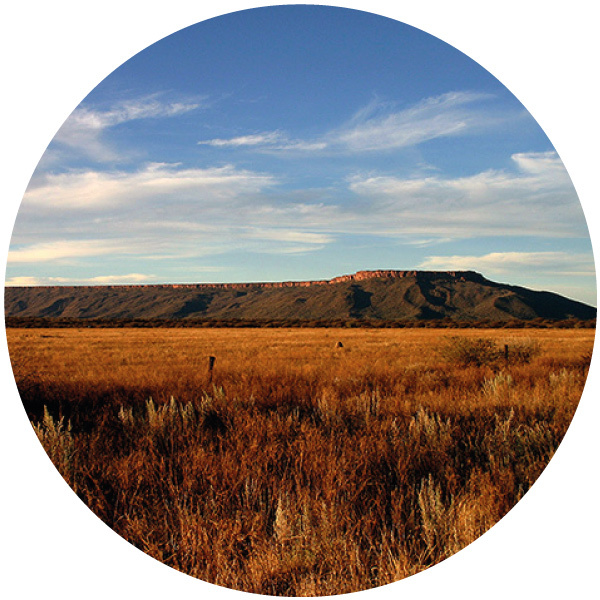 Your journey ends with a wondrous hike at the Waterberg Plateau. After a night in Namibia’s capital Windhoek and now fully prepared, it is time to hit the road. Driving southwards, you will encounter the beautiful, raw nature of the Kalahari Desert. This is a unique piece of earth, as it is one of the oldest. It has been home to the hunter-gatherers of the San-tribe for a long period of time. Despite of the name of this desert meaning “Great thirst”, it rains relatively much, meaning it attracts plenty of wildlife. 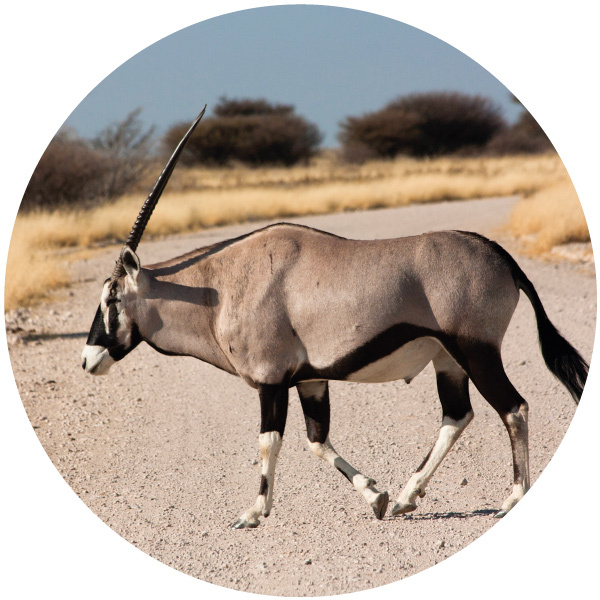 Keep your eyes open for the “alternative big 5”: oryx, lion, springbok, eland and leopard. 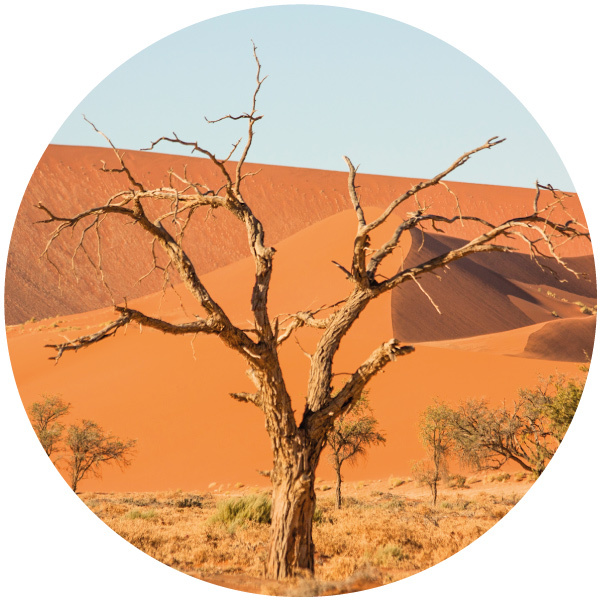 Red dunes, distinguished from each other by sharp lines, and their contrast with an eye blinding white salt pan and dead black trees… Sossusvlei is probably the most well-known image of Namibia, and cannot be missed in any trip. The shapes and colors make it almost seem surreal. Climb one of the world's highest dunes for the most spectacular sunrise and sunset, a feast for your eyes! This part of the Namib-Naukluft Park is called the “Namib Sand Sea”: as far as you can see there are dunes of rusty colored sand. A nature drive in the area or a visit to Sesriem Canyon are definitely worth doing when you want to explore more of the surroundings. A sea of sand changes into an ocean at the Atlantic Coast. Of course, you can leave the shore and discover life at the water: go on a kayak tour or catamaran cruise and visit the seal colonies. If you are lucky, you might even be followed by dolphins! For those who want more adrenaline, the dunes in the surroundings lend themselves for some exciting sand boarding and quad biking. Very interesting is a “living desert tour”, where you learn about how life miraculously learned to adapt to the harsh conditions of the desert. 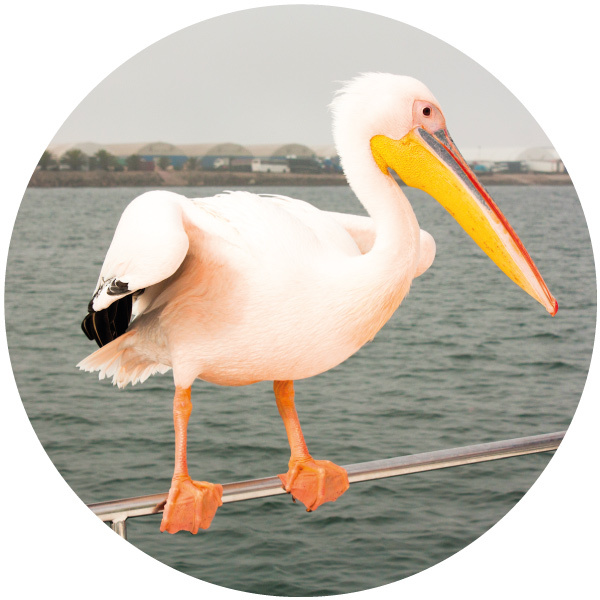 The coastal town Swakopmund has some characteristics of a German seaside resort: ocean, beach and swaying palm trees are mixed with typical German architecture. On menus you might find ``Bratwurst`` and ``Apfelstrudel”. The journey continues northwards, where you can make a stop at Cape Cross: as far as you look you will see seals scattered along the coast! You will then turn back inland, where you will see an enormous mountain looming ahead of you: the Brandberg, best known for its ancient “White Lady” rock painting. Entering beautiful Damaraland, it feels like you are going back in time. You are driving through a dusted landscape scattered with gigantic boulders and ancient, dry riverbeds. 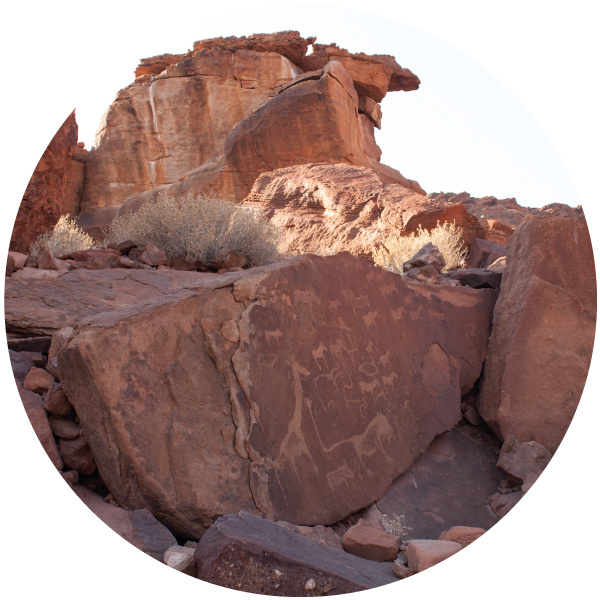 Somewhere hidden in the landscape you will find the fascinating number of 2,500 rock engravings of Twyfelfontein. These beautiful inscriptions once served as a means of communication for the San-people, informing fellow tribe members about nearby waterholes and predators. Seeing this rock art from close by is something that will definitely leave an impression. While driving, you might be lucky to bump into the largest inhabitant of the area, the mysterious desert elephants! These beautiful giants have miraculously learned to adapt to the severe conditions of the desert. In Kaokoland you will reach the most northern part of your trip. 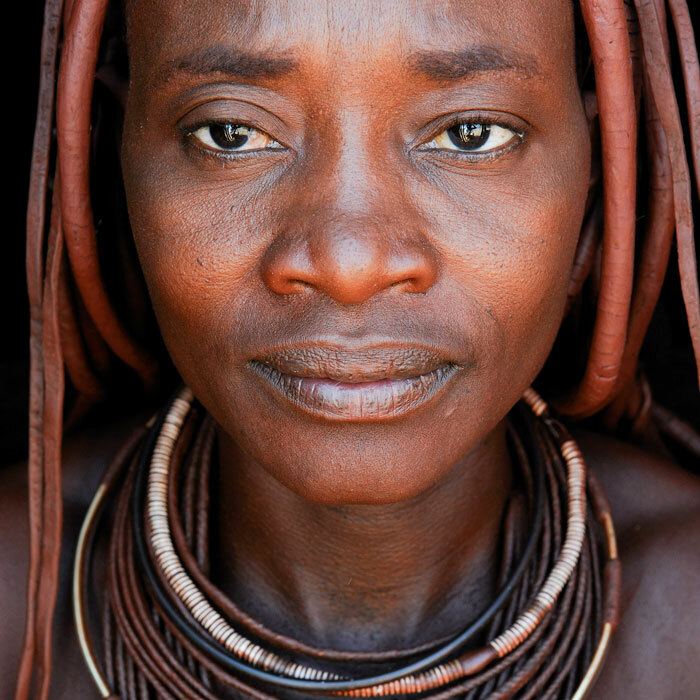 This part of Namibia is also known as the country's last wilderness, and is home to the traditional Himba tribe. Time and modernity seem to pass by their traditions easily: they still live their authentic, nomadic lifestyle where life is organized around cattle. A guided visit to one of their villages will give you more insight in their way of life. Opuwo is the capital of the north. It is a real African town where people of all tribes meet each other for trade and pleasure. Make a stroll through town and experience the vibrant African atmosphere. 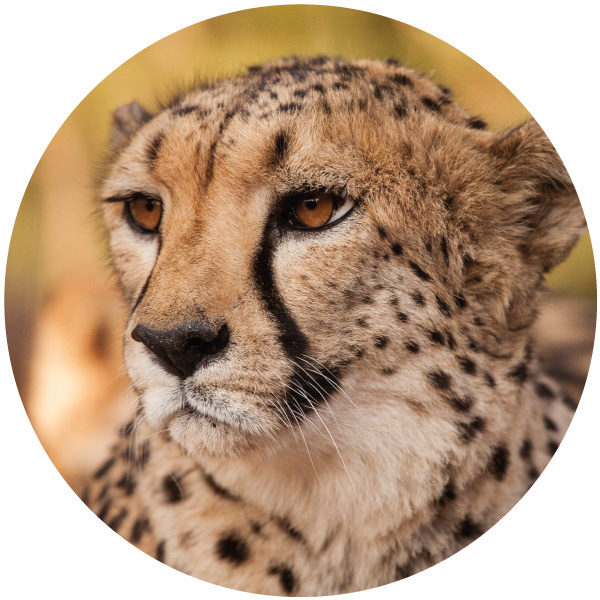 Before heading into Etosha National Park, you will stay the night at a Cheetah Farm, where you can have an unforgettable experience when seeing these beautiful cats from close by. Prepare yourself for the largest amounts of wildlife you might have ever seen when you enter Etosha National Park. The 22,270 square kilometers of protected nature form the largest national park of Southern Africa, meaning you will be needing a couple of days to cross the park. To see as much as possible from Etosha, you will be staying at different lodges or campsites within or surrounding the park. It is a unique experience to drive your own safari! Grab your binoculars and see if you can spot lions, cheetahs and leopards. In the late afternoon, settle down at one of the park’s waterholes and let the animals come to you: elephants, giraffes, zebras and antelopes will gather to relieve themselves from their thirst. Have you ever wondered how it would be to experience life away from modernity? Near Grootfontein you will be visiting a San-village. 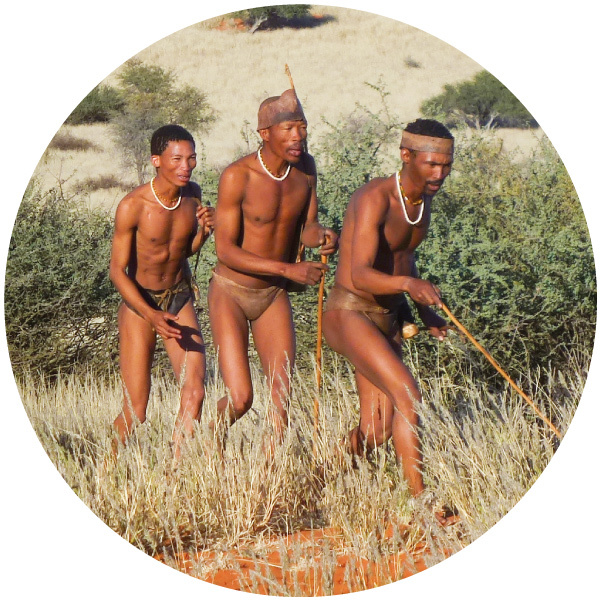 It is a unique experience to experience the hunter-gatherer lifestyle, the oldest of modern human beings. 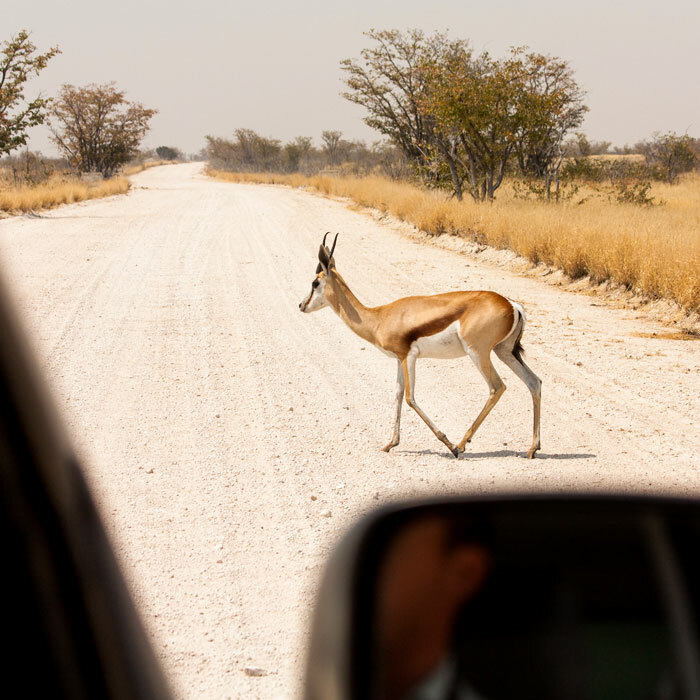 When driving to the Zambezi region, you will cross the veterinary fence north of Grootfontein. Directly after this checkpoint, you will see many villages and business along the road. This is probably more the African atmosphere you expected to find in an African country. The dry landscapes of Namibia make place for a lush oasis of green woodlands and blue rivers of this area that is better known by its former name, the Caprivi Strip. Join a boat cruise over the Kavango River or Kwando River during sunset and do not forget to stop at the elegant, tranquil Popa Falls. At the eastern Zambezi region you will cross the border to Botswana, where you will stay in Kasane. 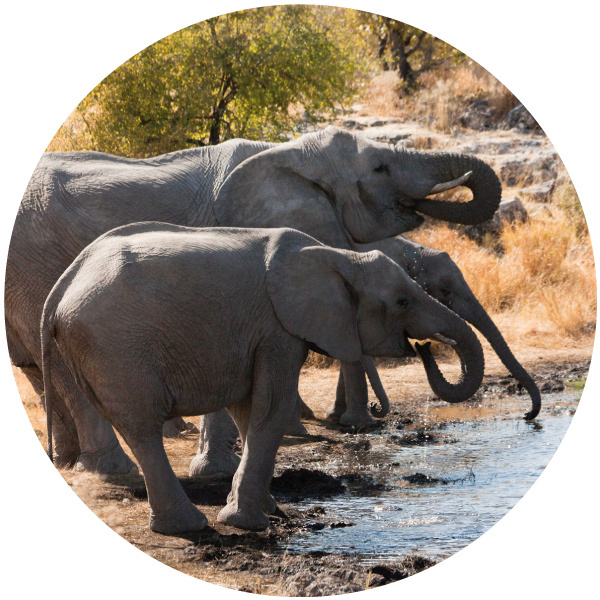 This is the perfect basis for a visit to the beautiful Chobe National Park, home to the largest elephant population of Africa. Up to 70,000 of these giant animals walk around the park. It is amazing to drive through this beautiful nature with your own car. There is even a spot where you can have your own picknick, however be aware of the hungry monkeys! 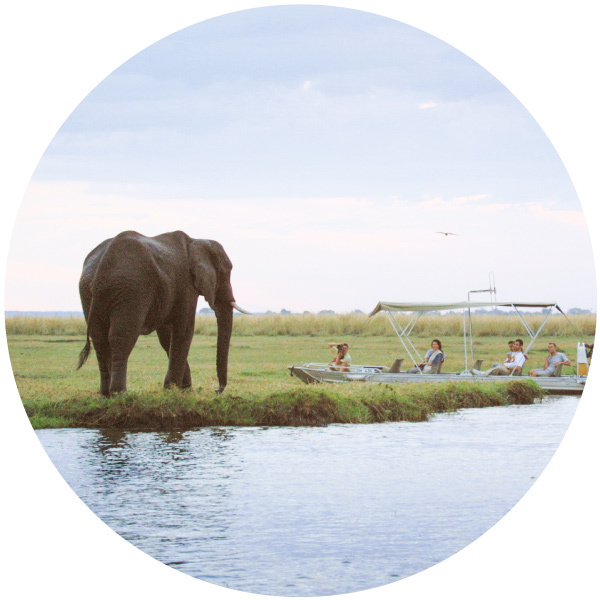 Go on a boat cruise to see elephants bathing from very close by, and being surrounded by hippos and crocodiles that hide under water. 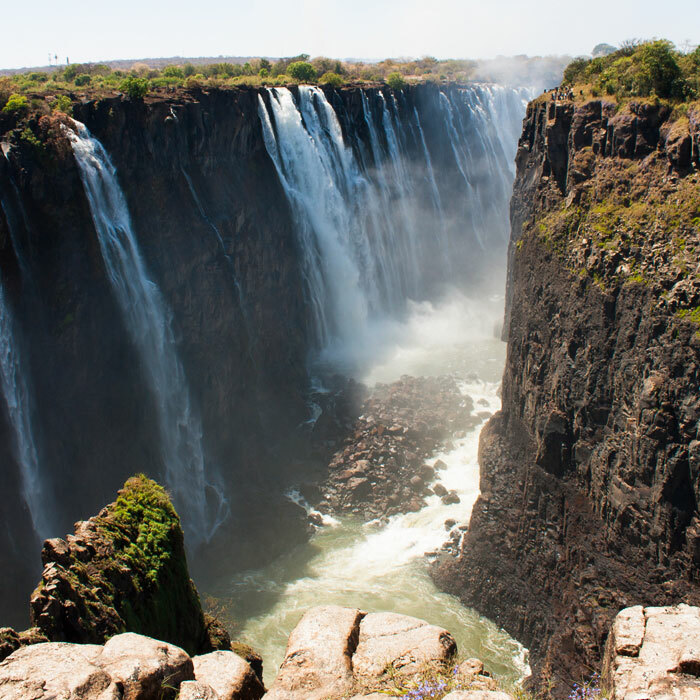 A day visit to Zimbabwe to see the spectacular Victoria Falls is definitely a must. Every minute, thousands of liters of water hurtle down into the abyss. Do not forget your raincoat! From Kasane you will be driving back to Namibia through the Zambezi region. The national parks of Mahango and Mudumu are wonderful areas to go on a safari, yourself or with a guided tour. 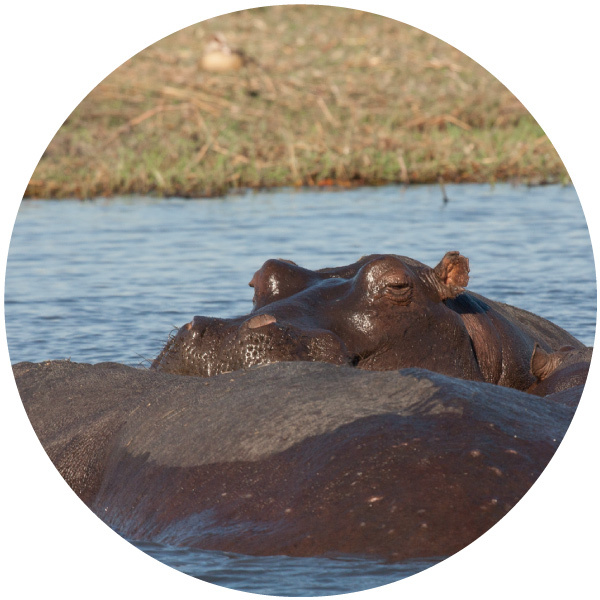 You will encounter other animal species than in Etosha National Park, such as roan- and sable antelopes, wild dogs, crocodiles and hippos. 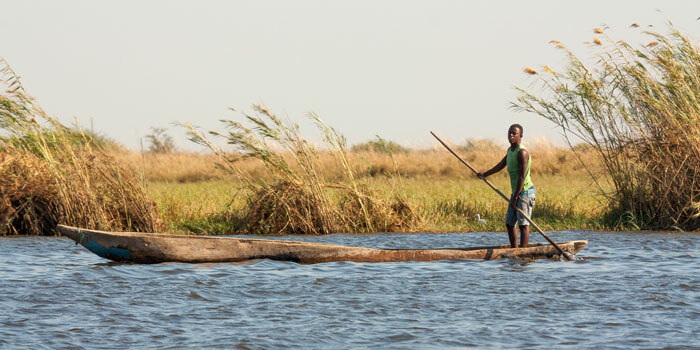 Traditional life in the Caprivi is again different from the life in the south and Damaraland. There are two living museums, close to Rundu and Kongola, which are definitely worth a visit. Leaving the vegetation rich Caprivi behind, your next stop is the Waterberg Plateau, rising up from the surface for about 400 meters high at some places. The Waterberg Plateau and 41,000 hectares of surrounding land was declared a Nature Reserve in 1972. The areas nature is again different than you experienced earlier. The brick-red sandstone plateau is crowned with lush vegetation and supports a wide diversity of flora and fauna. This national park lends itself for some nice hikes. Haven’t seen enough animals yet? Go on a game drive and look for buffalos or the white rhino. Your journey comes to an end in Windhoek, where you will have enough opportunity to relax and rewind from an amazing adventure and buy your last souvenirs before going home. 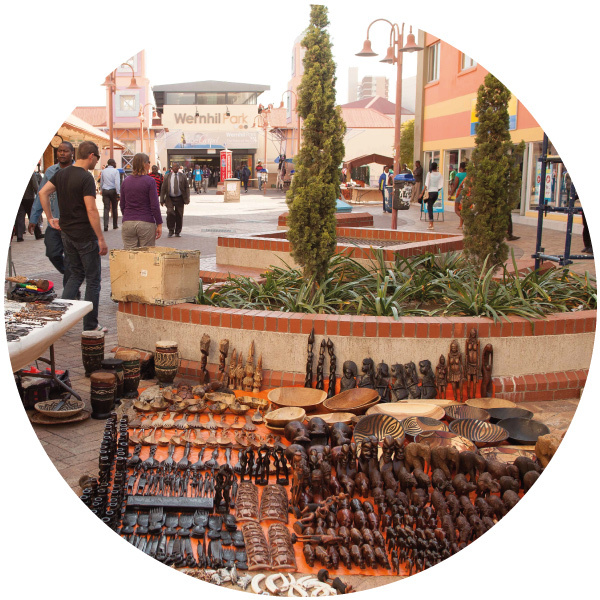 Consider a visit to the Namibian Craft Market in town, located in the old brewery and for a last dinner choose one of Windhoek’s nice restaurants.